Blind Date with a Book is back, just in time for Valentine’s Day. Where: Killam Library on Studley Campus, MacRae Library on the Agricultural Campus, and Kellogg Library, Tupper location on Carleton Campus. What: Fall in love with a good book. If you’re looking for mystery, fantasy, poetry, romance, or… science fiction, the Killam, MacRae, and Kellogg libraries are where you’ll want to be on Wednesday (or Thursday if there’s a storm!). Blind Date with a Book wants to set you up with the book of your dreams, featuring sharp and witty profiles better than anything you’ll find on Tinder. Just come to one of the above mentioned Dal Libraries on February 13. Check out the display of discreetly wrapped books and peruse the descriptive tags. You’re sure to find one that quickens your pulse. 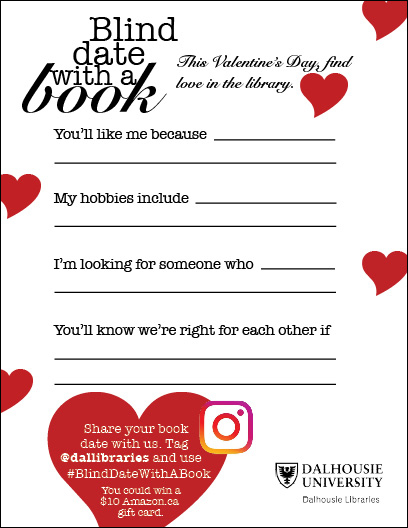 Post a photo of your date to Instagram and tag dallibraries using the hashtag #BlindDateWithABook. You could win a $10 Amazon gift card. What would be a good title for a Led Zeppelin biopic?